Get back to your arcade racing roots! Photon Creations presents Super Photon Racing, a top-down racing game based on the classic old skool arcade racing games. 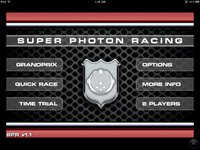 Race your Photon Car through a variety of tracks and game modes. From racing in a championship to competing against people around the world to set the best lap times, to racing against a friend/foe on the same device in the unique 2 player mode. 3 GP cups all with 3 different difficulty levels. Get 3rd place or better in each cup to unlock the harder difficulties. Select a track, difficulty, opponents and lap count and just race. A unique mode where both players use the same device to compete against each other and the AI. Compete against players around the world to set the best lap times for each track. Ingame best-laps & ranking provides realtime updating as you set your best lap.